With Photoshop card companies get to put guys in uniform even if the don't have pictures of them. 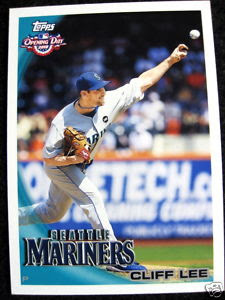 Cliff Lee was traded to the Seattle Mariners during the offseason and Topps has him pitching in a Mariners uniform already. Awesome. However, it seems as though the Mariners also had an affinity for Harry Kalas and lamented his death last year. Do the opening Day packs have the Million Card Giveaway redemptions? You should see the Hideki Matsui OD card. Absolutely horrendous. Doesn't Topps realize this is what updated sets are for? Opening Day is for kids, they'll never notice. But we do. I don't know of too many kids anymore that collect cards. I have three of my own 14,12, and 7. I also know a lot of their friends. They are all into WOW and Pokemon cards. Sigh. Yes, Paul, I know. It was a joke. I don't believe any kids actually buy Opening Day. I find it sad that the kids aren't into baseball cards anymore. The gaming cards to them are our baseball cards. You wouldn't believe the stuff my kids have memorized off those cards. Just like we use to do with BB cards. The only thing I like about this years OD is the blue parallels. I'll be it's a gimmick/variation. I'm 13, Have been collecting cards since I was seven. Opening Day is good because I just like to find my favorite players. Otherwise, good for nothing. But yeah, my friends love the gaming cards. Can't see why, when Baseball Cards are around. And to PunkRockPaint, I'm pretty sure they don't.